a Choi Yong-kun was previously head of state as the President of the Presidium of the Supreme People's Assembly. b Proclaimed "eternal President" after his death. "Kim Il-sung" in hancha (top) and Chosŏn'gŭl (bottom) scripts. Kim Il-sung (officially transcribed Kim Il Sung; English pronunciation: /ˈkɪm ˈɪlˈsʌŋ, -ˈsʊŋ/; Chosŏn'gŭl: 김일성; Korean pronunciation: [kimils͈ʌŋ]; born Kim Sŏng-ju (김성주); 15 April 1912 – 8 July 1994) was the first leader of North Korea which he ruled from the country's establishment in 1948 until his death in 1994. He held the posts of Premier from 1948 to 1972 and President from 1972 to 1994. He was also the leader of the Workers' Party of Korea (WPK) from 1949 to 1994 (titled as Chairman from 1949 to 1966 and as General Secretary after 1966). Coming to power after the end of Japanese rule in 1945, he authorized the invasion of South Korea in 1950, triggering an intervention in defense of South Korea by the United Nations led by the United States. Following the military stalemate in the Korean War, a ceasefire was signed on 27 July 1953. He was the second longest-serving non-royal head of state/government in the 20th century, in office for more than 48 years. Under his leadership, North Korea became a communist state with a publicly owned and planned economy. It had close political and economic relations with the Soviet Union. By the 1960s, North Korea enjoyed a standard of living higher than the South, which was fraught with political instability and economic crises. The situation reversed in the mid-1970s, as a newly stable South Korea became an economic powerhouse fueled by Japanese and American investment, military aid and internal economic development while North Korea stagnated. Differences emerged between North Korea and the Soviet Union, central among them Kim Il-sung's philosophy of Juche, which focused on Korean nationalism and self-reliance. Despite this, the country received funds, subsidies and aid from the USSR (and the Eastern Bloc) until the dissolution of the USSR in 1991. The resulting loss of economic aid adversely affected the North's economy, causing widespread famine in 1994. During this period, North Korea also remained critical of the United States defense force's presence in the region, which it considered imperialism, having seized the American ship USS Pueblo (AGER-2) in 1968. He outlived Joseph Stalin by four decades and Mao Zedong by almost two and remained in power during the terms of office of six South Korean Presidents, ten U.S. Presidents and the rule of British monarchs George VI and later his daughter Elizabeth II. Known as the Great Leader (Suryong), he was the focus of a personality cult which dominated domestic politics in North Korea. At the 6th WPK Congress in 1980, his oldest son Kim Jong-il was elected as a Presidium member and chosen as his heir apparent to the supreme leadership. Kim Il-sung's birthday is a public holiday in North Korea called the "Day of the Sun". 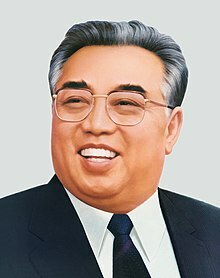 In 1998, Kim Il-sung was declared "eternal President of the Republic". During his rule, North Korea was widely characterized as a totalitarian state with widespread human rights abuses, including mass executions and prison camps. Controversy surrounds Kim's life before the founding of North Korea, with some labeling him an impostor. Several sources indicate that the name "Kim Il-sung" had previously been used by a prominent early leader of the Korean resistance, Kim Kyung-cheon. :44 The Soviet officer Grigory Mekler, who worked with Kim during the Soviet occupation, said that Kim assumed this name from a former commander who had died. However, historian Andrei Lankov has argued that this is unlikely to be true. Several witnesses knew Kim before and after his time in the Soviet Union, including his superior, Zhou Baozhong, who dismissed the claim of a "second" Kim in his diaries. :55 Historian Bruce Cumings pointed out that Japanese officers from the Kwantung Army have attested to his fame as a resistance figure. :160–161 Historians generally accept the view that, while Kim's exploits were exaggerated by the personality cult which was built around him, he was a significant guerrilla leader. Around the time the song Star of Korea was being spread, my comrades changed my name and began to call me Han Byol ... meaning "One Star". It was Pyon Tae U and other public-minded people in Wujiazi and such young communists as Choe Il Chon who proposed to change my name into Kim Il Sung. Thus I was called by three names, Song Ju, Han Byol and Il Sung. ... I did not like to be called by another name. Still less did I tolerate the people extolling me by comparing me to a star or the sun; it did not befit me, [as a] young man. But my comrades would not listen to me, no matter how sternly I rebuked them for it or argued against it.... It was in the spring of 1931 when I spent some three weeks in prison, having been arrested by the warlords in Guyushu, that the name Kim Il Sung appeared in the press for the first time. Until that time most of my acquaintances had called me by my real name, Song Ju. It was in later years when I started the armed struggle in east Manchuria that I was called by one name, Kim Il Sung, by my comrades. These comrades upheld me as their leader, even giving me a new name and singing a song about me. Thus they expressed their innermost feelings. According to Kim, his family was not very poor, but was always a step away from poverty. Kim said that he was raised in a Presbyterian family, that his maternal grandfather was a Protestant minister, that his father had gone to a missionary school and was an elder in the Presbyterian Church, and that his parents were very active in the religious community. According to the official version, Kim’s family participated in anti-Japanese activities and in 1920 they fled to Manchuria. Like most Korean families, they resented the Japanese occupation of the Korean peninsula, which began on 29 August 1910.:12 Another view seems to be that his family settled in Manchuria, as many Koreans had at the time to escape famine. Nonetheless, Kim's parents, especially Kim's mother Kang Ban Suk, played a role in the anti-Japanese struggle that was sweeping the peninsula. :16 Their exact involvement—whether their cause was missionary, nationalist, or both—is unclear nevertheless. :53 Still, Japanese repression of opposition was brutal, resulting in the arrest and detention of more than 52,000 Korean citizens in 1912 alone. :13 This repression forced many Korean families to flee Korea and settle in Manchuria. In 1931 Kim joined the Communist Party of China—the Communist Party of Korea had been founded in 1925, but had been thrown out of the Comintern in the early 1930s for being too nationalist. He joined various anti-Japanese guerrilla groups in northern China. Feelings against the Japanese ran high in Manchuria, but as of May 1930 the Japanese had not yet occupied Manchuria. On 30 May 1930 a spontaneous violent uprising in eastern Manchuria arose in which peasants attacked some local villages in the name of resisting "Japanese aggression." The authorities easily suppressed this unplanned, reckless and unfocused uprising. Because of the attack, the Japanese began to plan an occupation of Manchuria. In a speech before a meeting of Young Communist League delegates on 20 May 1931 in Yenchi County in Manchuria, Kim warned the delegates against such unplanned uprisings as the 30 May 1930 uprising in eastern Manchuria. Four months later, on 18 September 1931, the "Mukden Incident" occurred, in which a relatively weak dynamite explosive charge went off near a Japanese railroad in the town of Mukden in Manchuria. Although no damage occurred, the Japanese used the incident as an excuse to send armed forces into Manchuria and to appoint a puppet government. In 1935, Kim became a member of the Northeast Anti-Japanese United Army, a guerrilla group led by the Communist Party of China. Kim was appointed[by whom?] the same year to serve as political commissar for the 3rd detachment of the second division, consisting of around 160 soldiers. :53 Here Kim met the man who would become his mentor as a Communist, Wei Zhengmin, Kim's immediate superior officer, who served at the time as chairman of the Political Committee of the Northeast Anti-Japanese United Army. Wei reported directly to Kang Sheng, a high-ranking party member close to Mao Zedong in Yan'an, until Wei's death on 8 March 1941. In 1935 Kim took the name Kim Il-sung, meaning "Kim become the sun". :30 Kim was appointed commander of the 6th division in 1937, at the age of 24, controlling a few hundred men in a group that came to be known as "Kim Il-sung's division". While commanding this division he executed a raid on Poch’onbo, on 4 June 1937. Although Kim's division only captured the small Japanese-held town just within the Korean border for a few hours, it was nonetheless considered[by whom?] a military success at this time, when the guerrilla units had experienced difficulty in capturing any enemy territory. This accomplishment would grant Kim some measure of fame among Chinese guerrillas, and North Korean biographies would later exploit it as a great victory for Korea. For their part the Japanese regarded Kim as one of the most effective and popular Korean guerrilla leaders. :160–161 He appeared on Japanese wanted lists as the "Tiger". The Japanese "Maeda Unit" was sent to hunt him in February 1940. Later in 1940, the Japanese kidnapped a woman named Kim Hye-sun, believed to have been Kim Il Sung's first wife. After using her as a hostage to try to convince the Korean guerrillas to surrender, but to no avail, she was killed. Kim was appointed commander of the 2nd operational region for the 1st Army, but by the end of 1940 he was the only 1st Army leader still alive. Pursued by Japanese troops, Kim and what remained of his army escaped by crossing the Amur River into the Soviet Union. :53–54 Kim was sent to a camp at Vyatskoye near Khabarovsk, where the Soviets retrained the Korean Communist guerrillas. Kim became a Major in the Soviet Red Army and served in it until the end of World War II in 1945. Kim Il-sung (centre) and Kim Tu-bong (second from right) at the joint meeting of the New People's Party and the Workers' Party of North Korea in Pyongyang, 28 August 1946. The Soviet Union declared war on Japan on 8 August 1945, and the Red Army entered Pyongyang on 24 August 1945. Stalin had instructed Lavrentiy Beria to recommend a Communist leader for the Soviet-occupied territories and Beria met Kim several times before recommending him to Stalin. To solidify his control, Kim established the Korean People's Army (KPA), aligned with the Communist Party, and he recruited a cadre of guerrillas and former soldiers who had gained combat experience in battles against the Japanese and later against Nationalist Chinese troops. Using Soviet advisers and equipment, Kim constructed a large army skilled in infiltration tactics and guerrilla warfare. Prior to Kim's invasion of the South in 1950, which triggered the Korean War, Joseph Stalin equipped the KPA with modern, Soviet-built medium tanks, trucks, artillery, and small arms. Kim also formed an air force, equipped at first with Soviet-built propeller-driven fighters and attack aircraft. Later, North Korean pilot candidates were sent to the Soviet Union and China to train in MiG-15 jet aircraft at secret bases. Despite United Nations plans to conduct all-Korean elections, the Soviets held elections of their own in their zone on 25 August 1948 for a Supreme People's Assembly. Voters were presented with a single list from the Communist-dominated Democratic Front for the Reunification of the Fatherland. The Democratic People's Republic of Korea was proclaimed on 9 September 1948, with Kim as the Soviet-designated premier. On 15 August 1948, the south had declared statehood as the Republic of Korea. The Communist Party was nominally led by Kim Tu-bong, though from the outset Kim Il-sung held the real power. In February 1946 Kim Il-sung decided to introduce a number of reforms. Over 50% of the arable land was redistributed, an 8-hour work day was proclaimed and all heavy industry was to be nationalized. There were improvements in the health of the population after he nationalized healthcare and made it available to all citizens. Archival material suggests that North Korea's decision to invade South Korea was Kim's initiative, not a Soviet one. Evidence suggests that Soviet intelligence, through its espionage sources in the US government and British SIS, had obtained information on the limitations of US atomic bomb stockpiles as well as defense program cuts, leading Stalin to conclude that the Truman administration would not intervene in Korea. China acquiesced only reluctantly to the idea of Korean reunification after being told by Kim that Stalin had approved the action. The Chinese did not provide North Korea with direct military support (other than logistics channels) until United Nations troops, largely US forces, had nearly reached the Yalu River late in 1950. At the outset of the war in June and July, North Korean forces captured Seoul and occupied most of the South, save for a small section of territory in the southeast region of the South that was called the Pusan Perimeter. But in September, the North Koreans were driven back by the US-led counterattack that started with the UN landing in Incheon, followed by a combined South Korean-US-UN offensive from the Pusan Perimeter. By October, UN forces had retaken Seoul and invaded the North to reunify the country under the South. On 19 October, US and South Korean troops captured P’yŏngyang, forcing Kim and his government to flee north, first to Sinuiju and eventually into Kanggye. On 25 October 1950, after sending various warnings of their intent to intervene if UN forces did not halt their advance,:23 Chinese troops in the thousands crossed the Yalu River and entered the war as allies of the KPA. There were nevertheless tensions between Kim and the Chinese government. Kim had been warned of the likelihood of an amphibious landing at Incheon, which was ignored. There was also a sense that the North Koreans had paid little in war compared to the Chinese who had fought for their country for decades against foes with better technology. :335–336 The UN troops were forced to withdraw and Chinese troops retook P’yŏngyang in December and Seoul in January 1951. In March, UN forces began a new offensive, retaking Seoul and advanced north once again halting at a point just north of the 38th Parallel. After a series of offensives and counter-offensives by both sides, followed by a grueling period of largely static trench warfare that lasted from the summer of 1951 to July 1953, the front was stabilized along what eventually became the permanent "Armistice Line" of 27 July 1953. Over 2.5 million people died during the Korean war. Chinese and Russian documents from that time reveal that Kim became increasingly desperate to establish a truce, since the likelihood that further fighting would successfully unify Korea under his rule became more remote with the UN and US presence. Kim also resented the Chinese taking over the majority of the fighting in his country, with Chinese forces stationed at the center of the front line, and the Korean People's Army being mostly restricted to the coastal flanks of the front. With the end of the Korean War, despite the failure to unify Korea under his rule, Kim il-sung proclaimed the war a victory in the sense that he had remained in power in the north. However, the three-year war left North Korea devastated, and Kim immediately embarked on a large reconstruction effort. He launched a five-year national economic plan to establish a command economy, with all industry owned by the state and all agriculture collectivised. The economy was focused on heavy industry and arms production. Both South and North Korea retained huge armed forces to defend the 1953 Demilitarized Zone, and US forces remained in the South. In the ensuing years, Kim established himself as an independent leader of international communism. In 1956, he joined Mao in the "anti-revisionist" camp, which did not accept Nikita Khrushchev's program of de-Stalinization, yet he did not become a Maoist himself. At the same time, he consolidated his power over the Korean communist movement. Rival leaders were eliminated. Pak Hon-yong, leader of the Korean Communist Party, was purged and executed in 1955. Choe Chang-ik appears to have been purged as well. The 1955 Juche speech, which stressed Korean independence, debuted in the context of Kim's power struggle against leaders such as Pak, who had Soviet backing. This was little noticed at the time until state media started talking about it in 1963. During the 1956 August Faction Incident, Kim Il-sung successfully resisted efforts by the Soviet Union and China to depose him in favor of Soviet Koreans or the pro-Chinese Yanan faction. The last Chinese troops withdrew from the country in October 1958, which is the consensus as the latest date when North Korea became effectively independent, though some scholars believe that the 1956 August incident demonstrated North Korea's independence. 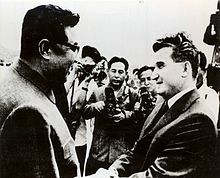 Kim greets visiting Romanian President Nicolae Ceaușescu in Pyongyang, 1971. Despite his opposition to de-Stalinization, Kim never officially severed relations with the Soviet Union, and he did not take part in the Sino-Soviet Split. After Khrushchev was replaced by Leonid Brezhnev in 1964, Kim's relations with the Soviet Union became closer. At the same time, Kim was increasingly alienated by Mao's unstable style of leadership, especially during the Cultural Revolution in the late 1960s. Kim in turn was denounced by Mao's Red Guards. 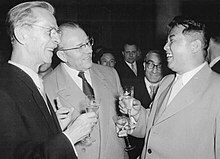 At the same time, Kim reinstated relations with most of Eastern Europe's communist countries, primarily Erich Honecker's East Germany and Nicolae Ceauşescu's Romania. Ceauşescu, in particular, was heavily influenced by Kim's ideology, and the personality cult that grew around him in Romania was very similar to that of Kim. However, Albania's Enver Hoxha (another independent-minded Communist leader) was a fierce enemy of the country and Kim Il sung, writing in June 1977 that "genuine Marxist-Leninists" will understand that the "ideology is guiding the Korean Workers' Party and the Communist Party of China...is revisionist" and adding later that month that "in Pyongyang, I believe that even Tito will be astonished at the proportions of the cult of his host [Kim Il Sung], which has reached a level unheard of anywhere else, either in past or present times, let alone in a country which calls itself socialist. He further claimed that "the leadership of the Communist Party of China has betrayed [the working people]. In Korea, too, we can say that the leadership of the Korean Workers' Party is wallowing in the same waters" and claimed that Kim Il Sung was begging for aid from other countries, especially among the Eastern Bloc and non-aligned countries like Yugoslavia. As a result, relations between North Korea and Albania would remain cold and tense right up until Hoxha's death in 1985. Although a resolute anti-communist, Zaire's Mobutu Sese Seko was also heavily influenced by Kim's style of rule. At the same time, Kim was establishing an extensive personality cult. North Koreans were taught that Kim was the "Sun of the Nation" and could do no wrong. Kim developed the policy and ideology of Juche in opposition to the idea of North Korea as a satellite state of China or the Soviet Union. A new constitution was proclaimed in December 1972, which created an executive presidency. Kim gave up the premiership and was elected president. On 14 April 1975, North Korea discontinued most formal use of its traditional units and adopted the metric system. In 1980, he decided that his son Kim Jong-il would succeed him, and increasingly delegated the running of the government to him. The Kim family was supported by the army, due to Kim Il-sung's revolutionary record and the support of the veteran defense minister, O Chin-u. At the Sixth Party Congress in October 1980, Kim publicly designated his son as his successor. In 1986, a rumor spread that Kim had been assassinated, making the concern for Jong-il's ability to succeed his father actual. Kim dispelled the rumors, however, by making a series of public appearances. It has been argued, however, that the incident helped establish the order of succession—the first patrifilial in a Communist state—which eventually would occur upon Kim Il-Sung's death in 1994. From about this time, North Korea encountered increasing economic difficulties. The practical effect of Juche was to cut the country off from virtually all foreign trade in order to make it entirely self-reliant. The economic reforms of Deng Xiaoping in China from 1979 onward meant that trade with the moribund economy of North Korea held decreasing interest for China. The collapse of communism in Eastern Europe and the Soviet Union, from 1989–1992, completed North Korea's virtual isolation. These events led to mounting economic difficulties because Kim refused to issue any economic or political reforms. Kim Il Sung's calcium deposit tumor is noticeable on the back of his head in this rare newsreel still image during a diplomatic meeting between him and Chinese Chairman Mao Zedong in Beijing, 1970. 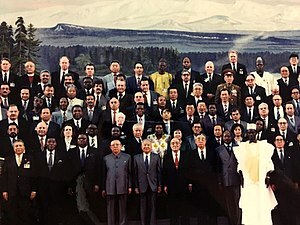 Kim Il-sung's 80th birthday ceremony with international guests, April 1992. To ensure a full succession of leadership to his son and designated successor Kim Jong-il, Kim turned over his chairmanship of North Korea's National Defense Commission—the body mainly responsible for control of the armed forces as well as the supreme commandership of the country's now million-man strong military force, the Korean People's Army—to his son in 1991 and 1993. So far, the elder Kim—even though he is dead—has remained the country's president, the general-secretary of its ruling Workers' Party of Korea, and the chairman of the Party's Central Military Commission, the party's organization that has supreme supervision and authority over military matters. In early 1994, Kim began investing in nuclear power to offset energy shortages brought on by economic problems. This was the first of many "nuclear crises". On 19 May 1994, Kim ordered spent fuel to be unloaded from the already disputed nuclear research facility in Yongbyon. Despite repeated chiding from Western nations, Kim continued to conduct nuclear research and carry on with the uranium enrichment program. In June 1994, former U.S. President Jimmy Carter travelled to Pyongyang for talks with Kim. To the astonishment of the United States and the International Atomic Energy Agency, Kim agreed to halt his nuclear research program and seemed to be embarking upon a new opening to the West. Kim Il-sung married twice. 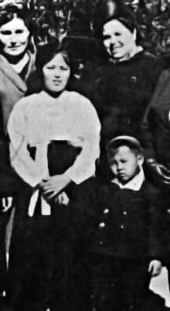 His first wife, Kim Jong-suk (1919–1949), gave birth to two sons before her death in childbirth during the delivery of a stillborn girl. Kim Jong-il was his oldest son. The other son (Kim Man-il, or Shura Kim) of this marriage died in 1947 in a swimming accident. Kim married Kim Sung-ae in 1952, and it is believed he had three children with her: Kim Yŏng-il (not to be confused with the former Premier of North Korea of the same name), Kim Kyŏng-il and Kim Pyong-il. Kim Pyong-il was prominent in Korean politics until he became ambassador to Hungary. Since 2015 Kim Pyong-il has been ambassador to the Czech Republic. Kim was reported to have other children with women he was not married to. They included Kim Hyŏn-nam (born 1972, head of the Propaganda and Agitation Department of the Workers' Party since 2002). On his death in 1994, his eldest son Kim Jong-il succeeded him as supreme leader of North Korea. An official portrait of Kim Il-sung, issued after his death. On 8 July 1994, Kim Il-sung collapsed from a sudden heart attack at the age of 82. After the heart attack, Kim Jong-il ordered the team of doctors who were constantly at his father's side to leave, and arranged for the country's best doctors to be flown in from Pyongyang. After several hours, the doctors from Pyongyang arrived, but despite their efforts to save him, Kim Il-sung died. After the traditional Confucian Mourning period, his death was declared thirty hours later. Kim Il-sung's death resulted in nationwide mourning and a ten-day mourning period was declared by Kim Jong-il. His funeral in Pyongyang was attended by hundreds of thousands of people who were flown into the city from all over North Korea. Kim Il-sung's body was placed in a public mausoleum at the Kumsusan Palace of the Sun, where his preserved and embalmed body lies under a glass coffin for viewing purposes. His head rests on a traditional Korean pillow and he is covered by the flag of the Workers' Party of Korea. Newsreel video of the funeral at Pyongyang was broadcast on several networks, and can now be found on various websites. The Mansudae Grand Monuments, depicting large bronze statues of Kim Il-sung and his son Kim Jong-il. There are over 500 statues of Kim Il-sung in North Korea, similar to the many statues and monuments put up by Eastern Bloc leaders to themselves. The most prominent are at Kim Il-sung University, Kim Il-sung Stadium, Mansudae Hill, Kim Il-sung Bridge and the Immortal Statue of Kim Il-sung. Some statues have reportedly been destroyed by explosions or damaged with graffiti by North Korean dissidents. :201 Yŏng Saeng ("eternal life") monuments have been erected throughout the country, each dedicated to the departed "Eternal Leader". Kim Il-sung's image, especially his posthumous portrait released in 1994, is prominent in places associated with public transportation, which hangs at every North Korean train station and airport. It is also placed prominently at the border crossings between China and North Korea. Thousands of gifts to Kim Il-sung from foreign leaders are housed in the International Friendship Exhibition. Kim Il-sung's birthday, "Day of the Sun", is celebrated every year as a public holiday in North Korea. The associated April Spring Friendship Art Festival gathers hundreds of artists from all over the world. According to North Korean sources, Kim Il-sung had received 230 foreign orders, medals and titles from 70 countries since the 1940s until, and after, his death. They include: The Soviet Order of the Red Banner and Order of Lenin (twice), Order of the Republic of Indonesia (first class), the Bulgarian Order of Georgi Dimitrov (twice), the Togolese Order of Mono (Grand Cross), the Order of the Yugoslav Star (Great Star), the Cuban Order of José Martí (twice), the East German Order of Karl Marx (twice), Order of the Republic of Malta, the Burkinabe Order of the Gold Star of Nahouri, Order of the Grand Star of Honour of Socialist Ethiopia, the Nicaraguan Augusto Cesar Sandino Order [es], the Vietnamese Gold Star Order, the Czechoslovak Order of Klement Gottwald, the Royal Order of Cambodia (Grand Cross), the Malagasy Grand National Cross (first class), the Mongolian Order of Sukhbaatar, and the Romanian orders of Order of Victory of Socialism [nl] and Order of the Star of the Romanian Socialist Republic (first class with band). "Song of General Kim Il-sung"
^ a b Cumings, Bruce (2003). North Korea: Another Country. New York: New Press. ISBN 978-1-56584-940-2. ^ "NK founder's second wife died in 2014: Unification Ministry". www.koreaherald.com. 27 December 2018. ^ "Kim Il Sung". American Heritage Dictionary of the English Language (Fifth ed.). n.d. Retrieved 6 March 2017. ^ Buzo, Adrian (2002). The Making of Modern Korea. London: Routledge. p. 140. ISBN 978-0-415-23749-9. ^ Cumings, Bruce (2005). Korea's Place in the Sun: A Modern History. New York: W. W. Norton & Company. p. 434. ISBN 978-0-393-32702-1. ^ Robinson, Michael E (2007). Korea's Twentieth-Century Odyssey. Honolulu: University of Hawaii Press. p. 153. ISBN 978-0-8248-3174-5. ^ Bluth, Christoph (2008). Korea. Cambridge: Polity Press. p. 34. ISBN 978-07456-3357-2. ^ Black Book of Communism, pg. 564. ^ The Worst of the Worst: The World's Most Repressive Societies Archived June 7, 2013, at the Wayback Machine. Freedom House, 2012. ^ a b c d e Jasper Becker (1 May 2005). Rogue Regime : Kim Jong Il and the Looming Threat of North Korea. Oxford University Press. ISBN 978-0-19-803810-8. Archived from the original on 18 May 2016. ^ "Soviets groomed Kim Il Sung for leadership". Vladivostok News. 10 January 2003. Archived from the original on 10 June 2009. ^ a b c d e Lankov, Andrei (2002). From Stalin to Kim Il Sung: The Formation of North Korea 1945–1960. Rutgers University Press. ISBN 978-0813531175. ^ a b Cumings, Bruce (17 September 2005). Korea's Place in the Sun: A Modern History (Updated). New York: W W Norton & Co. ISBN 978-0-393-32702-1. Archived from the original on 18 May 2016. ^ Buzo, Adrian (2002). The Making of Modern Korea. London: Routledge. p. 56. ISBN 978-0-415-23749-9. ^ Robinson, Michael E (2007). Korea's Twentieth-Century Odyssey. Honolulu: University of Hawaii Press. p. 87. ISBN 978-0-8248-3174-5. ^ Oberdorfer, Don; Carlin, Robert (2014). The Two Koreas: A Contemporary History. Basic Books. pp. 13–14. ISBN 9780465031238. ^ a b Kim Il-sung (1994). With the Century (PDF). 2. Pyongyang: Foreign Languages Publishing House. OCLC 28377167. Retrieved 17 October 2014. ^ a b "Soviet Officer Reveals Secrets of Mangyongdae". Daily NK. 2014-01-02. Archived from the original on 11 February 2014. Retrieved 15 April 2014. ^ "PETER HITCHENS: North Korea, the last great Marxist bastion, is a real-life Truman show". Daily Mail. London. 8 October 2007. Archived from the original on 23 July 2012. ^ Byrnes, Sholto (7 May 2010). "The Rage Against God, By Peter Hitchens". The Independent. London. Archived from the original on 12 May 2010. ^ Smith, Lydia (2014-07-08). "Kim Il-sung Death Anniversary: How the North Korea Founder Created a Cult of Personality". International Business Times UK. Archived from the original on 6 October 2014. Retrieved 2014-10-01. ^ Sang-Hun, Choe; Lafraniere, Sharon (27 August 2010). "Carter Wins Release of American in North Korea". The New York Times. Archived from the original on 30 June 2017. ^ Suh Dae-Sook, Kim Il Sung: The North Korean Leader, Columbia University Press (1998) p. 7. ^ Kim Il-Sung, "Let Us Repudiate the 'Left' Adventurist Line and Follow the Revolutionary Organizational Line" contained in On Juche in Our Revolution (Foreign Languages Publishers: Pyongyang, Korea, 1973)3. ^ Yamamuro, Shin'ichi (2006). Manchuria Under Japanese Dominion. ISBN 9780812239126. Archived from the original on 18 May 2016. Retrieved February 8, 2016. ^ Kim Il-Sung, "Let Us Repudiate the 'Left' Adventurist Line and Follow the Revolutionary Organizational Line" contained in On Juche in Our Revolution, pp.1-15. ^ Kim Il-Sung, "On Waging Armed Struggle Against Japanese Imperialism" on 16 December 1931 contained in On Juche in Our Revolution, pp. 17-20. ^ Suh Dae-Sook, Kim Il Sung: The North Korean Leader, Columbia University Press (1998) pp. 8–10. ^ a b c d Bradley K. Martin (2004). Under the Loving Care of the Fatherly Leader: North Korea and the Kim Dynasty. Thomas Dunne Books. ISBN 978-0-312-32322-6. ^ Robinson, Michael E (2007). Korea's Twentieth-Century Odyssey. Honolulu: University of Hawaii Press. pp. 87, 155. ISBN 978-0-8248-3174-5. ^ a b Lone, Stewart; McCormack, Gavan (1993). Korea since 1850. Melbourne: Longman Cheshire. p. 100. ^ a b Mark O'Neill. "Kim Il-sung's secret history | South China Morning Post". Scmp.com. Archived from the original on 27 February 2014. Retrieved 2014-04-15. ^ a b Armstrong, Charles (2013-04-15). The North Korean Revolution, 1945–1950. Cornell University Press. ^ a b Lankov, Andrei (2012-01-25). "Terenti Shtykov: the other ruler of nascent N. Korea". The Korea Times. Archived from the original on 17 April 2015. Retrieved April 14, 2015. ^ Blair, Clay, The Forgotten War: America in Korea, Naval Institute Press (2003). ^ Behnke, Alison (2012-08-01). Kim Jong Il's North Korea. ISBN 9781467703550. ^ Mossman, Billy (June 29, 2005). United States Army in the Korean War: Ebb and Flow November 1950-July 1951. University Press of the Pacific. p. 51. ^ Sandler, Stanley (1999). The Korean War: No Victors, No Vanquished. The University Press of Kentucky. p. 108. ^ a b David Halberstam. Halberstam, David (25 September 2007). The Coldest Winter: America and the Korean War. Hyperion. Kindle Edition. ^ Bethany Lacina and Nils Petter Gleditsch, Monitoring Trends in Global Combat: A New Dataset of Battle Deaths Archived 12 October 2013 at the Wayback Machine, European Journal of Population (2005) 21: 145–166. ^ "25 October 1950". teachingamericanhistory.org. ^ Timothy Hildebrandt, "Uneasy Allies: Fifty Years of China-North Korea Relations" Archived 24 February 2015 at the Wayback Machine, Asia Program Special Report, September 2003, Woodrow Wilson International Centre for Scholars. ^ Chung, Chin O. Pyongyang Between Peking and Moscow: North Korea’s Involvement in the Sino-Soviet Dispute, 1958-1975. University of Alabama. 1978. ^ French, Paul. North Korea: State of Paranoia. New York: St. Martin’s Press. 2014. ^ a b Kim Young Kun; Zagoria, Donald S. (December 1975). "North Korea and the Major Powers". Asian Survey. 15 (12): 1017–1035. doi:10.2307/2643582. JSTOR 2643582. ^ Behr, Edward Kiss the Hand You Cannot Bite, New York: Villard Books, 1991 page 195. ^ Enver Hoxha, "Reflections on China II: Extracts from the Political Diary", Institute of Marxist-Leninist Studies at the Central Committee of the Party of Labour of Albania," Tirana, 1979, pp 516, 517, 521, 547, 548, 549. ^ Radio Free Europe/Radio Liberty Research 17 December 1979 quoting Hoxha's Reflections on China Volume II: "In Pyongyang, I believe that even Tito will be astonished at the proportions of the cult of his host, which has reached a level unheard of anywhere else, either in past or present times, let alone in a country which calls itself socialist." "Albanian Leader's 'Reflections on China,' Volume II". CEU.hu. Archived from the original on 8 September 2009. Retrieved 2008-10-30. ^ Howard W. French, With Rebel Gains and Mobutu in France, Nation Is in Effect Without a Government Archived 30 June 2017 at the Wayback Machine, The New York Times (17 March 1997). ^ a b c d Lankov, Andrei (2015). The Real North Korea: Life and Politics in the Failed Stalinist Utopia. Oxford: Oxford University Press. ISBN 978-0-19-939003-8. ^ "DPR Korea", Official site, Asia–Pacific Legal Metrology Forum, 2015, archived from the original on 9 February 2017 . ^ Haberman, Clyde; Times, Special to The New York (1986-11-17). "Kim Il Sung, at 74, Is Reported Dead". The New York Times. Archived from the original on 19 March 2017. Retrieved 2017-03-19. ^ Saxonberg, Steven (14 February 2013). Transitions and Non-Transitions from Communism: Regime Survival in China, Cuba, North Korea, and Vietnam. Cambridge University Press. p. 123. ISBN 978-1-107-02388-8. Archived from the original on 18 May 2016. ^ Henry, Terrence (2005-05-01). "After Kim Jong Il". The Atlantic. Retrieved 2014-10-01. ^ Demick, Barbara: Nothing to Envy: Ordinary Lives in North Korea. ^ a b Portal, Jane; British Museum (2005). Art under control in North Korea. Reaktion Books. p. 82. ISBN 978-1-86189-236-2. ^ "The Chosun Ilbo (English Edition): Daily News from Korea - N.Korean Dynasty's Authority Challenged". English.chosun.com. 2012-02-13. Archived from the original on 29 September 2012. Retrieved 2012-11-09. ^ "Controversy Stirs Over Kim Monument at PUST" NK Daily. Archived 12 April 2010 at the Wayback Machine. Retrieved 24 April 2010. ^ "North Korean museum shows off leaders' gifts". The Age. Reuters. December 21, 2006. ^ Birthday of Kim Il-sung. Holidays, Festivals, and Celebrations of the World Dictionary (Fourth ed.). Omnigraphics. 2010. Retrieved 3 May 2015 – via TheFreeDictionary.com. ^ Choi Song Min (16 April 2013). "Spring Art Festival Off the Schedule". DailyNK. Archived from the original on 13 March 2015. Retrieved 3 May 2015. ^ Jo Am; An Chol-gang, eds. (2002). "The Foreign Orders and Honorary Titles Awarded to President Kim Il Sung". Korea in the 20th Century: 100 Significant Events. Translated by Kim Yong-nam; Kim Kyong-il; Kim Jong-shm. Pyongyang: Foreign Languages Publishing House. p. 162. OCLC 276996886. ^ Westad, Odd Arne (2017). The Cold War: A World History. New York: Basic Books. p. 190. ISBN 978-0-465-09313-7. ^ a b c "Kim Il Sung". Who's Who in Asian and Australasian Politics. London: Bowker-Saur. 1991. p. 146. ISBN 978-0-86291-593-3. ^ "Řád Klementa Gottwalda: za budování socialistické vlasti" (PDF) (in Czech). Archiv Kanceláře Prezidenta Republiky. 17 January 2015. p. 11. Retrieved 21 June 2018. ^ News from Hsinhua News Agency: Daily Bulletin. London: Xin hua tong xun she. 1 October 1965. p. 53. OCLC 300956682. ^ Summary of World Broadcasts: Far East, Part 3. Reading: Monitoring Service of the British Broadcasting Corporation. 1985. OCLC 976978783. ^ Sanders, Alan J. K. (2010). "Orders and medals". Historical Dictionary of Mongolia (Third ed.). Lanham: Scarecrow Press. p. 551. ISBN 978-0-8108-7452-7. ^ "Gifts of World People". Korea Today. No. 304–315. Pyongyang: Foreign Languages Publishing House. 1982. p. 58. ISSN 0454-4072. ^ "Immortal classical works written by President Kim Il Sung". Naenara. May 2008. Retrieved 2015-01-16. ^ ""Complete Collection of Kim Il Sung's Works" Off Press". KCNA. January 18, 2012. Archived from the original on 12 October 2014. Retrieved January 16, 2015. ^ Suk-Yong Kim (2018). "Dead Father's Living Body: Kim Il-sung's Seed Theory and North Korean Arts". In Kaminskij, Konstantin; Koschorke, Albrecht. Tyrants Writing Poetry. Budapest: Central European University Press. p. 159. ISBN 978-963-386-202-5. Baik Bong, "From Birth to Triumphant Return to Homeland," "From Building Democratic Korea to Chollima Flight," and "From Independent National Economy to 10-Point Political Programme". Blair, Clay, The Forgotten War: America in Korea, Naval Institute Press (2003). Kracht, Christian, The Ministry Of Truth: Kim Jong Il's North Korea, Feral House, October 2007, 132 pages, 88 color photographs, ISBN 978-1-932595-27-7. Lee Chong-sik. "Kim Il-Song of North Korea." Asian Survey. University of California Press. Vol. 7, No. 6, June 1967. DOI 10.2307/2642612. Available at Jstor. Sudoplatov, Pavel Anatoli, Schecter, Jerrold L., and Schecter, Leona P., Special Tasks: The Memoirs of an Unwanted Witness—A Soviet Spymaster, Little Brown, Boston (1994). Szalontai, Balázs, Kim Il Sung in the Khrushchev Era: Soviet-DPRK Relations and the Roots of North Korean Despotism, 1953-1964. Stanford: Stanford University Press; Washington, D.C.: Woodrow Wilson Center Press (2005). After his death in 1994, Kim Il-sung was proclaimed Eternal President. This page was last edited on 18 April 2019, at 08:46 (UTC).